A few weeks ago, my dad asked my mom what she wanted for their 45th wedding anniversary. Her answer: to go see Jillian & Zach. ♥ I was so excited to hear this news and I could not wait for the weekend to get here! 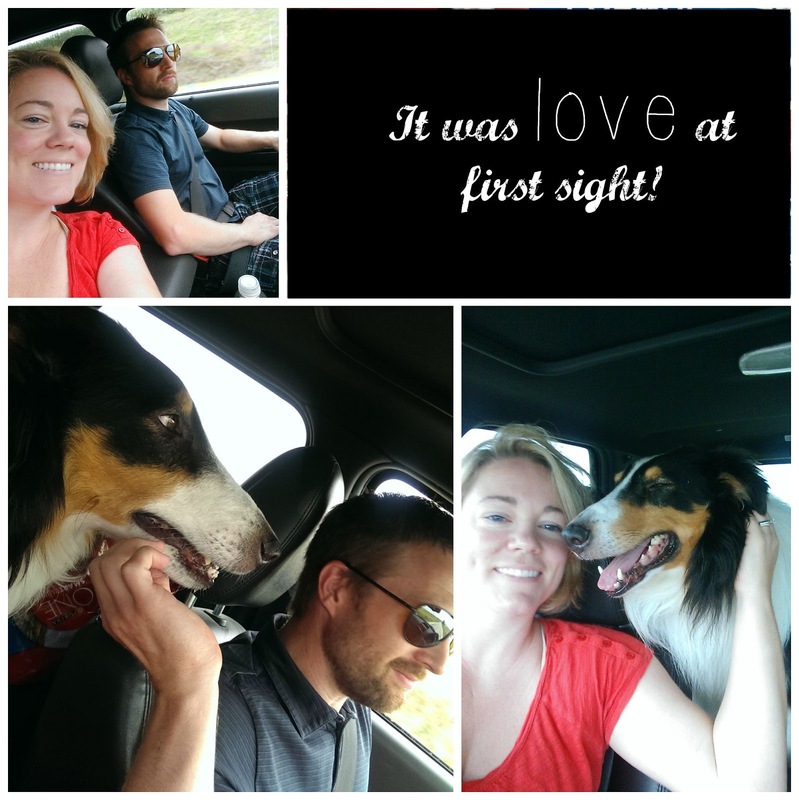 They decided to drive from NC to Iowa, which left me a little skeptical that the trip would actually happen... but it did! 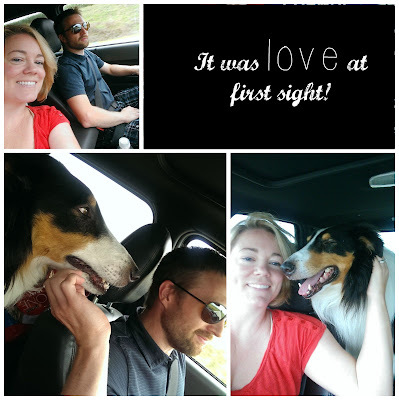 This past weekend my mom and dad made the 1000-mile journey to spend time on the farm with me, Zach, and Buddy! It was such a wonderful weekend filled with lots of hugs, yummy food, piano playing, Scrabble, shopping, and quality time. Not only did we celebrate a very special 45th wedding anniversary, we celebrated my belated birthday, an early Thanksgiving, Mom's early birthday, our new doggy (their new grand-dog), and Baby H! 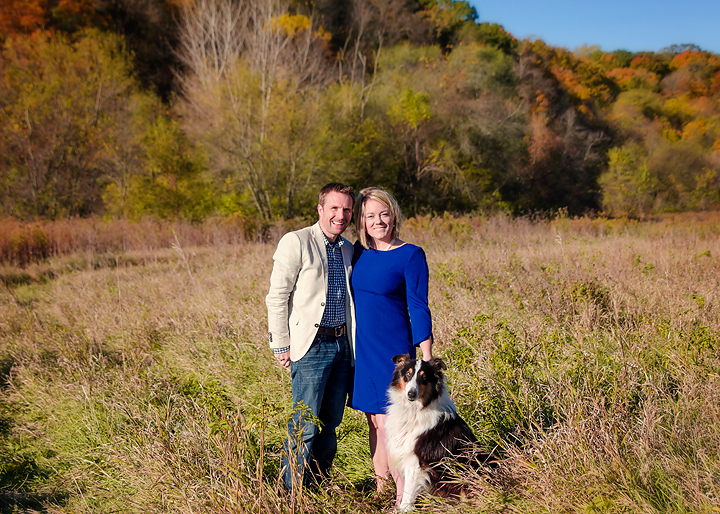 Yep, that's right... Zach and I are thrilled to be expecting Baby H this May, 2016! So if you're wondering where I've been the past few months, the computer has had to take a backseat to all-day morning sickness. I'm finally starting to feel better and ready to get caught back up to the blog and art. Please keep our little family in your thoughts and prayers as we navigate this exciting new adventure. I will say that I hesitated to share our special news online because I know how hard it is to read if you are hoping and praying for a baby of your own. Please know that you have been, and will continue to be, in my thoughts and prayers. Thank you to those who've prayed for us. God is Love and Love is Good. 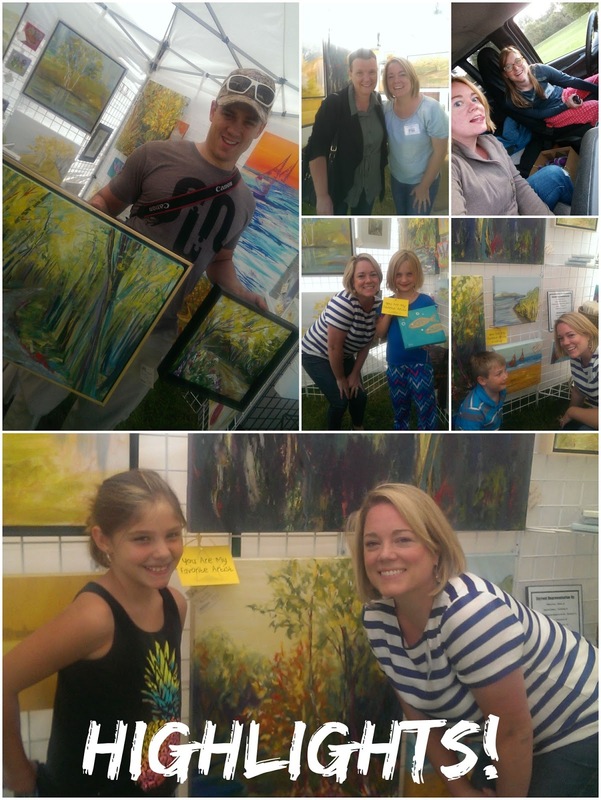 Last August, a few other Elkader artists and I joined together in the hopes of organizing Elkader's first ever fine art festival. With Kate showing at the prestigious Driftless Area Art Festival last year, Kris and I decided to drive out and take notes! 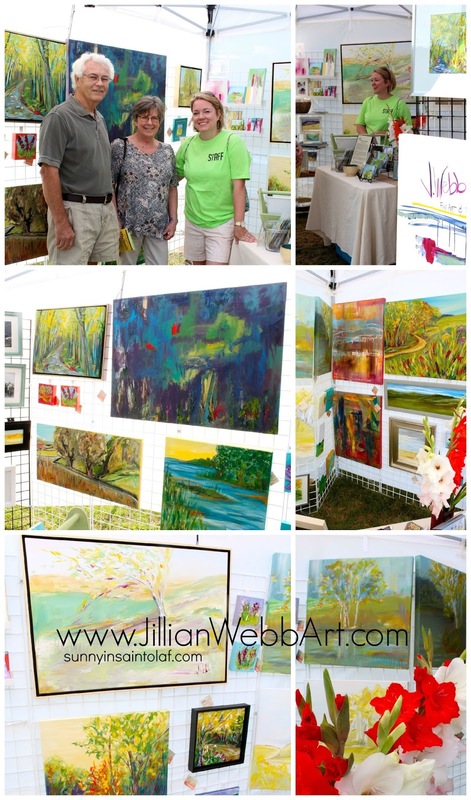 Boy, were we impressed with the level of organization, quality of work, booth displays, and overall atmosphere of this awesome fine art festival! 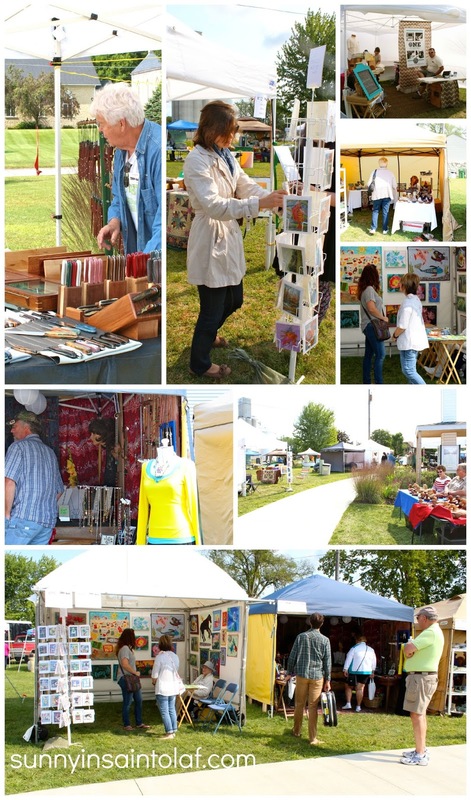 It was obvious that our group would look to Driftless as the benchmark to creating our very own fine art festival in Elkader. I even came home and immediately blogged the fun experience: The Driftless Area Art festival 2014. I also knew right away that I would apply for Driftless 2015! After applying, I received my acceptance letter and news that one of my images would be on the official festival postcard! Not only would my painting make the postcard, but they decided to use it on their "friend buttons" which were given to each festival supporter! How cool is that?! While I didn't have time to take very many photos of this year's Driftless experience, I did manage to snap some of the highlights with my cell phone! Meeting A North Carolina Native! 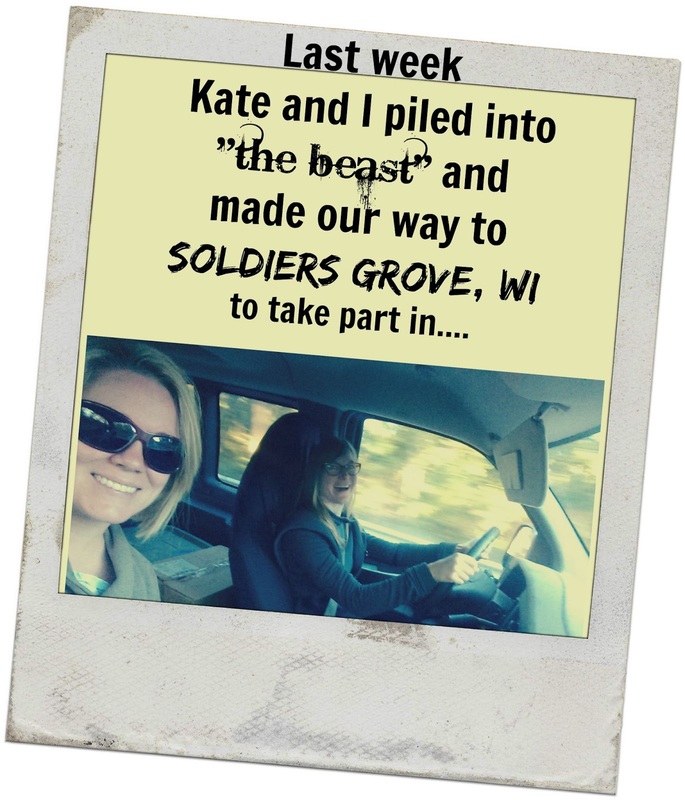 Would you believe that a fellow North Carolinian found me in the tiny town of Soldiers Grove in the middle of apple country Wisconsin?! And... we were even wearing the same shoes! Nice to meet you, Rachel! Hanging out with my Homie! After an amazing Saturday of art, Kate and I enjoyed the most delicious dinner provided by the Driftless Team and got to relax before we crashed! Exhaustion doesn't begin to describe it. Familiar Faces! Seeing folks who met me at Art Fair on the Green in La Crosse, people who recognized me from Elkader, and friends who surprised me with their presence, was awesome! Favorite Artist Awards! Receiving three very special Favorite Artist Awards was the icing on the cake! Thank you to my new friend Julissa (what a gorgeous name and sweet girl! ), and to Jillian and Declan for picking me as their favorite artist! I loved seeing which paintings sparked interest from these awesome kiddos! 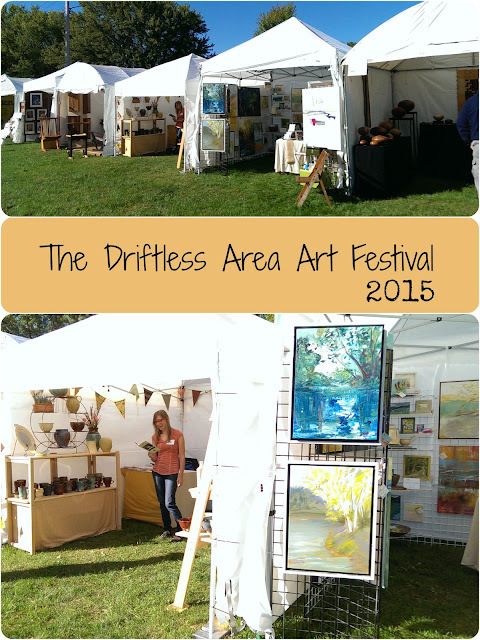 That about sums up my awesome weekend at the Driftless Area Art Festival! Thank you to all of the wonderful volunteers, event organizers, patrons, and fellow artists for making it a truly wonderful experience! I look forward to next time! P.S. 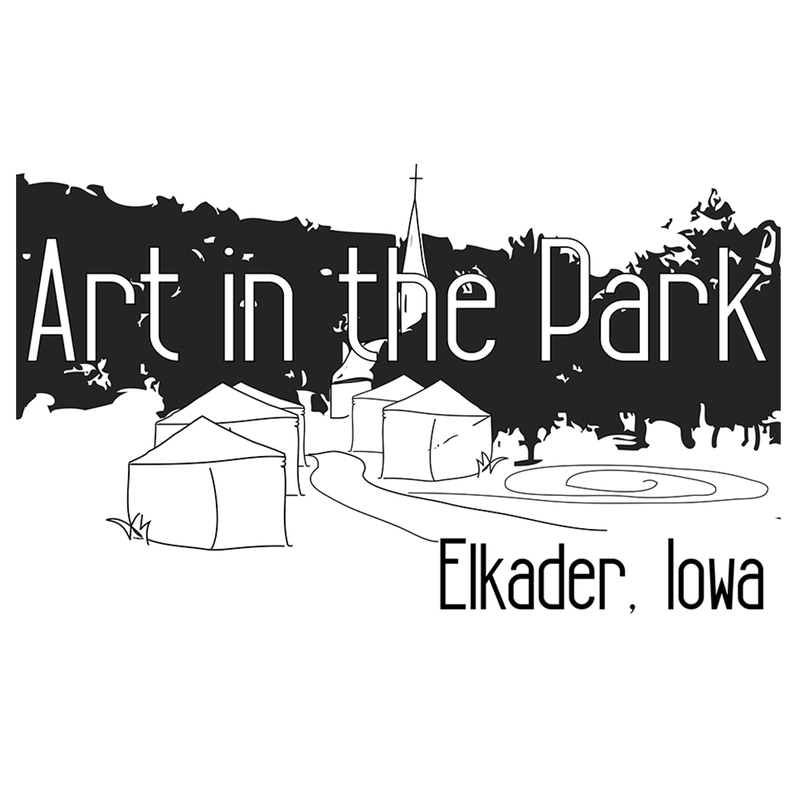 A huge thanks to Jerry and Liz Quebe for not only organizing a truly terrific event for eleven years running, but for offering their guidance, leadership, and encouragement as mentors to us on the Cultural and Entertainment District of Main Street Elkader as we planned our first annual Art in the Park! Art in the Park's first year was tremendous, thanks to role model festivals like the fabulous Driftless Area Art Festival! 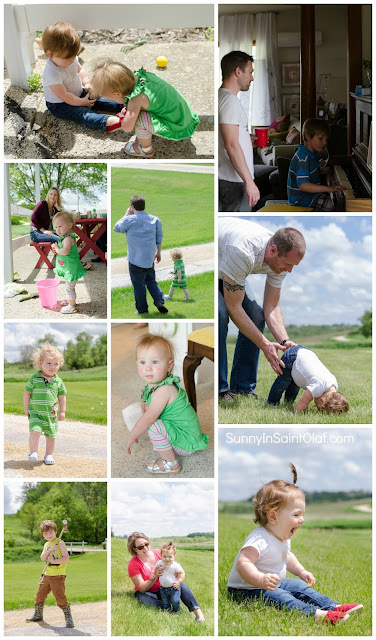 Labels: Adventures!, Art, CHECK-it-OUT!, inspiration, Iowa Art, JillianWebbArt, Summer 2015! 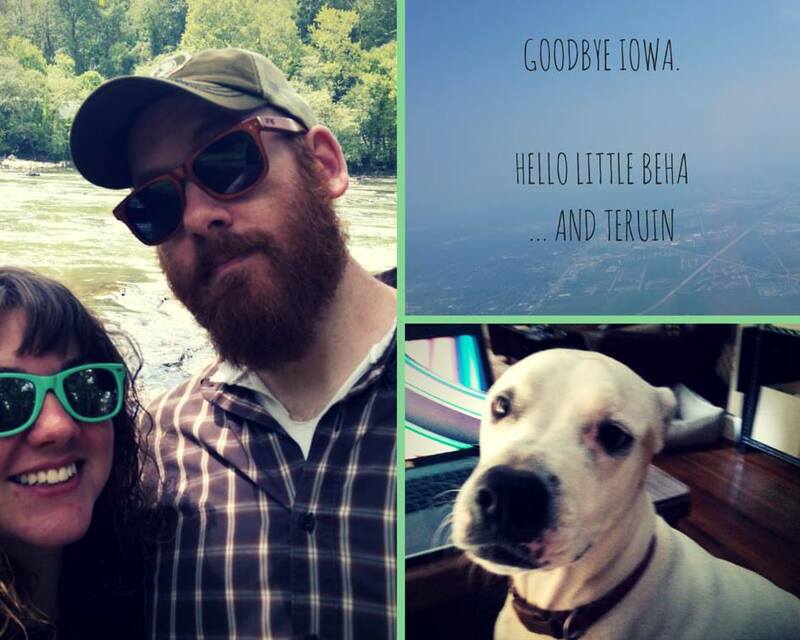 A few weeks ago I scooped up my sis from the Eastern Iowa Airport! We got to spend an entire week together on the farm and exploring small town Iowa. The sightseeing began on the drive home when we stopped for dinner in Manchester and got to peek at the Whitewater Park! The next day we traveled over to McGregor, an adorable Mississippi River town, for some shopping, brunch on the boat, and Lady Luck action! 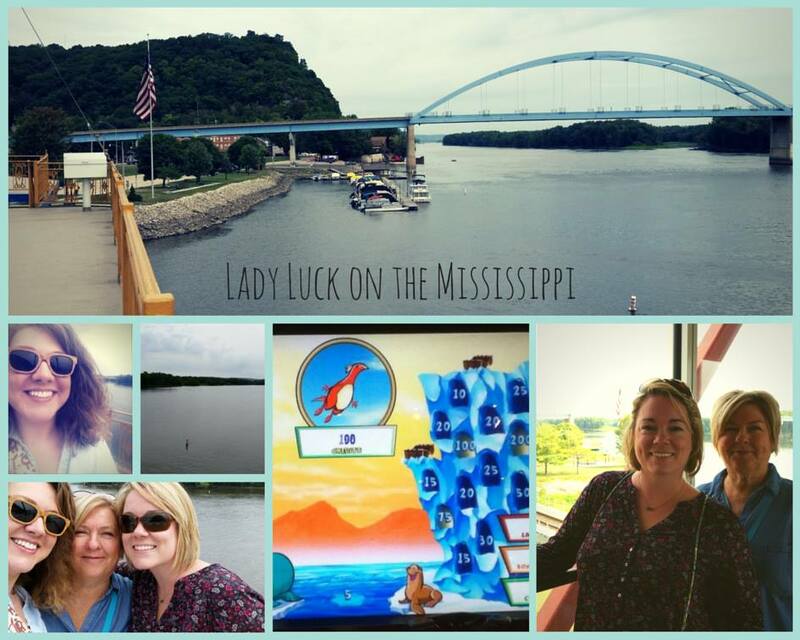 We even walked out on top of the boat for a Mississippi River Selfie. Oh, and our new favorite slot machine is now officially the Lucky Lemmings! 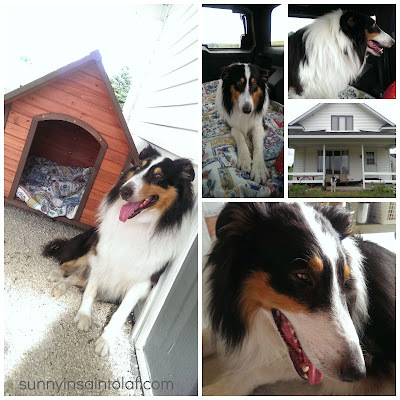 Traveling up to Decorah, to the Humane Society of Northeast Iowa, where Britty helped me find Buddy! Time with Zach and Momma D! A bonfire with friends and s'mores! A fun and frightening ;) tour of the infamous Spook Cave! Thank you to my sweet sis for making the journey out to Iowa for a week on the farm! We love you and and hope you'll come visit again soon! photos for this post are courtesy of miss Britt! 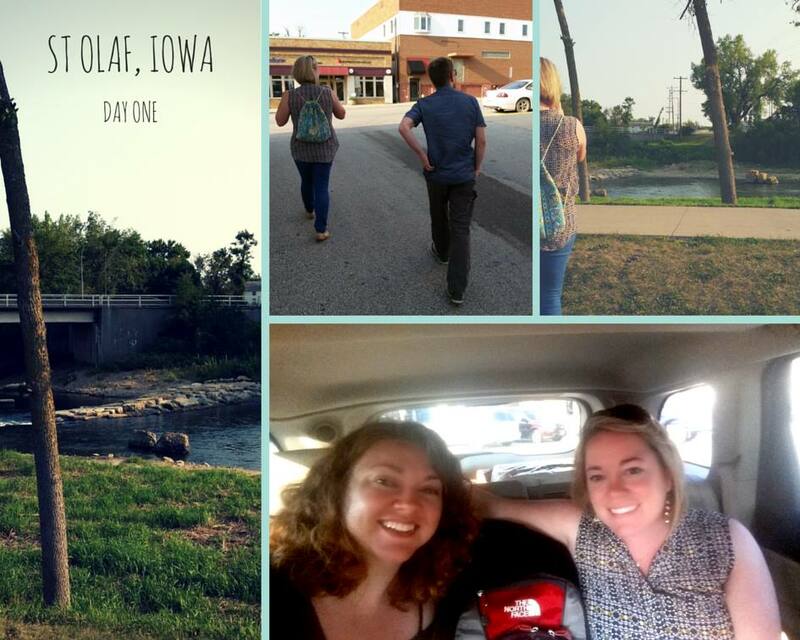 Labels: Adventures!, family♥, friends, Iowa, personal, Summer 2015! Zach fell for him, too! We had to leave him for a few days to have his vet check-up and paperwork handled. It was tough to leave him, but the staff and volunteers took such great care of our sweet Buddy. They went above and beyond in the whole adoption process and I couldn't be more grateful! We got to bring Buddy home yesterday! Are you looking for a pet of your own?! Check out The Humane Society of Northeast Iowa or your own local rescue. 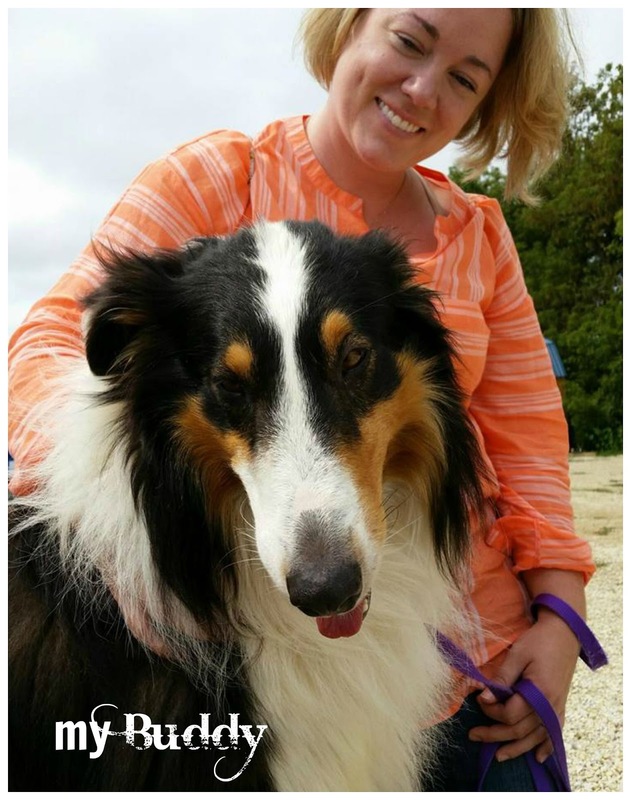 There are so many lovable animals hoping for their forever home! This may sound cliché, but rescuing a pet doesn't just make an animal's day, it will change your world... and that's the truth! 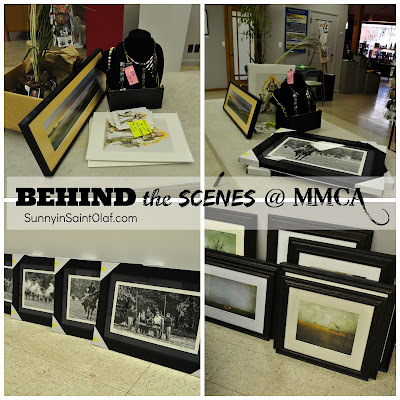 Catch the current exhibit at the McGregor-Marquette Center for the Arts for just a few more days! 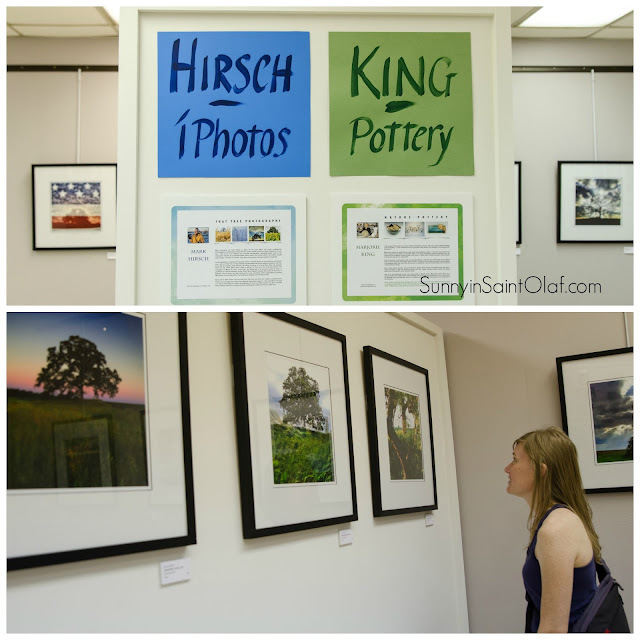 You definitely don't want to miss out on the beautiful works of Mark Hirsch or Marjorie King. To see my thoughts on the current show, check out my review! 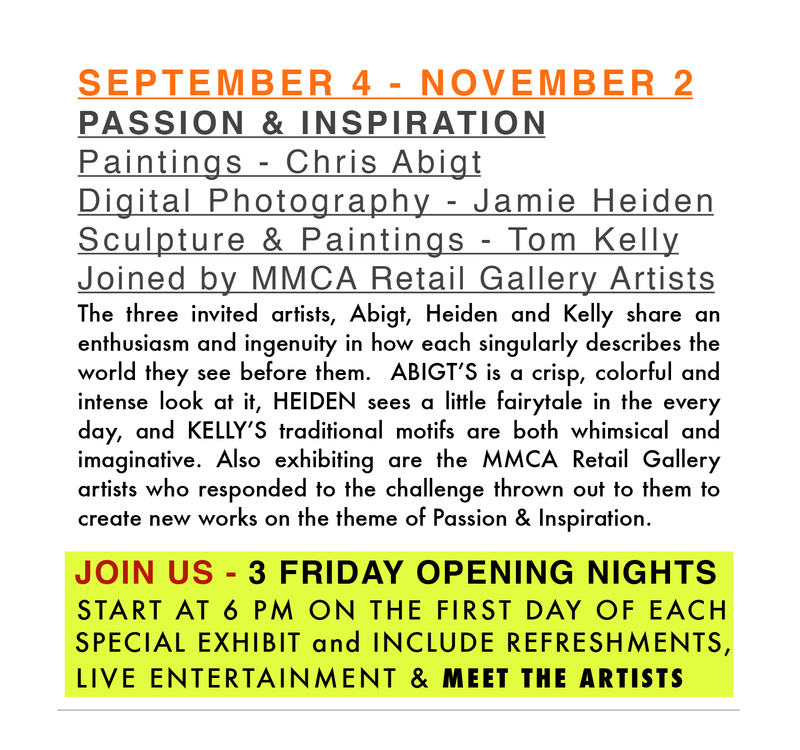 As the current exhibit wraps up, do not fear, there is still one more show for the 2015 season and it is scheduled to open this Friday, September 4th, in the Special Exhibit Gallery! 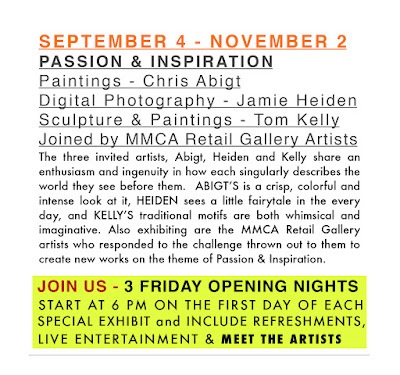 The third and final special exhibit is titled "Passion & Inspiration" and features Tom Kelly, Jamie Heiden, Chris Abigt, along with several of the Retail Gallery artists (including a few of my own JWebb pieces)! Please join us for this final opening reception for 2015! There will be yummy refreshments and live music by Gypsy Joy. I'd love to meet you! Friday, September 4th, from 6:00-8:30 p.m.
shhh.... see a little sneak preview below! 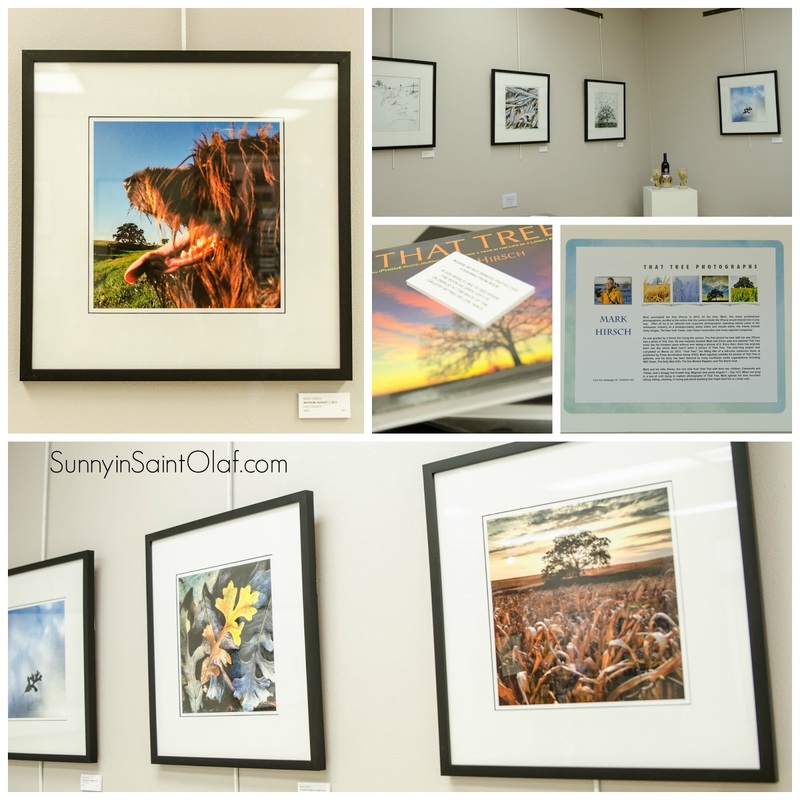 I personally cannot wait to see Jamie's whimsical nature photography and to shop the Retail Gallery! 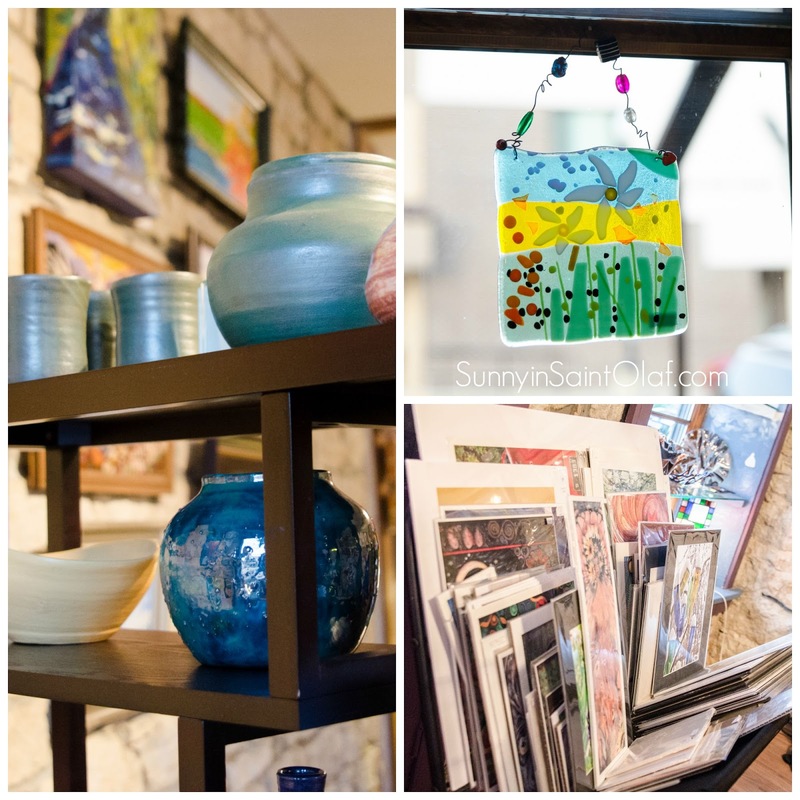 With so much amazing art, there is definitely something for everyone! Art in the Park Elkader │ WOW! 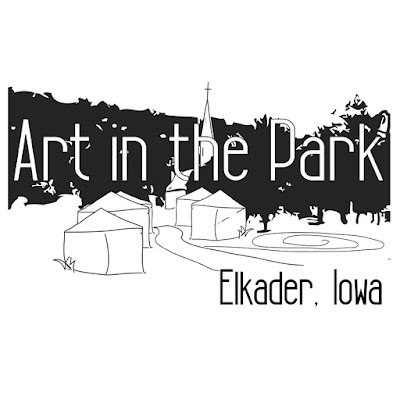 Last weekend the small town of Elkader, Iowa, nearly doubled in size as over 1,800 patrons and onlookers joined together in Founders Park to partake in the first annual Art in the Park! Live music and entertainment danced through the park; food vendors served up an artistic display of homemade delicious delicacies; smiling volunteers bounced from tent to tent to offer artists water, snacks, and even a break; and people from all over enjoyed shopping through the windy tent-lined sidewalk of local and regional artists! Festival goers were given People's Choice Award Ballots as they entered the festival. Not only did they get to cast a vote for their favorite artist, they could fill out the ballot and turn it in at the raffle tent to receive a free raffle ticket! 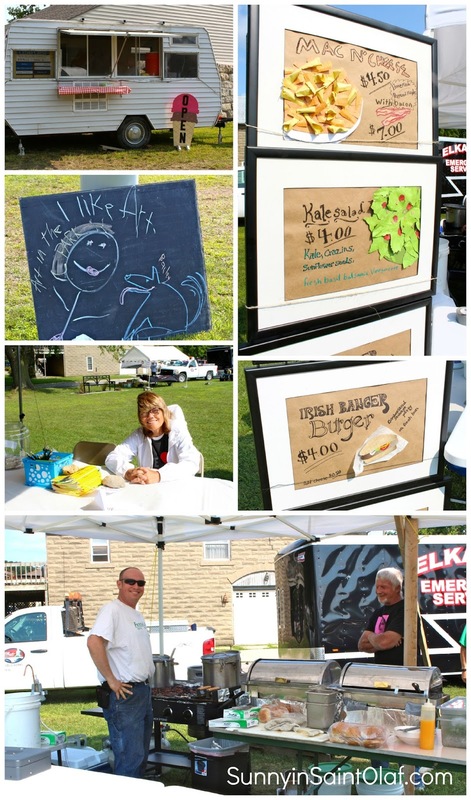 This went over quite well and we were able to see that not only were many people from out-of-town, but this was the first trip to Elkader for several of our festival goers! We were also excited to see that all of our artists received People's Choice Award votes! The 2015 People's Choice Award went to David Prehm, Booth #27. Prehm is a master watercolor artist from New Hampton, Iowa. His work is influenced by his love for the outdoors and it can be found locally at the McGregor-Marquette Center for the Arts. David Prehm's paintings have been collected throughout the Midwest, Norway, France, Czech Republic, Japan, New Zealand and Australia! You can also view David's work at Upper Iowa University on the Fayette Campus for a fine art exhibit that opened August 27th and will run through October 3rd. Don't miss it! The Committee Choice Award was given to an artist whose body of work and booth display exhibited exemplary quality, creativity, and overall aesthetic. It was not an easy decision to be made, all of the artists did such an amazing job! The first annual Committee Choice Award was given to Andrew Wroble, Booth #18. 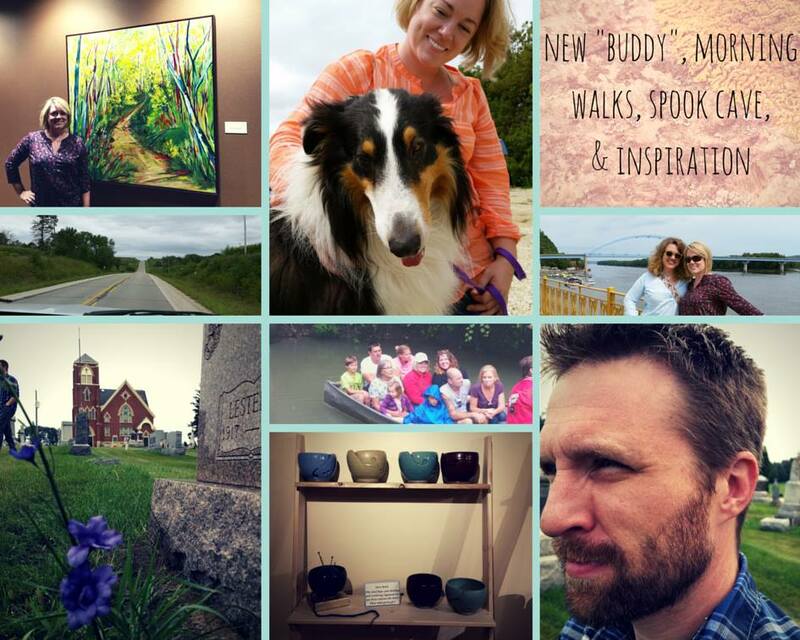 Wroble is woodland manager, a story teller, and an artist from Harpers Ferry, IA. He creates gorgeous treescape ink wash paintings that captivate and mystify. 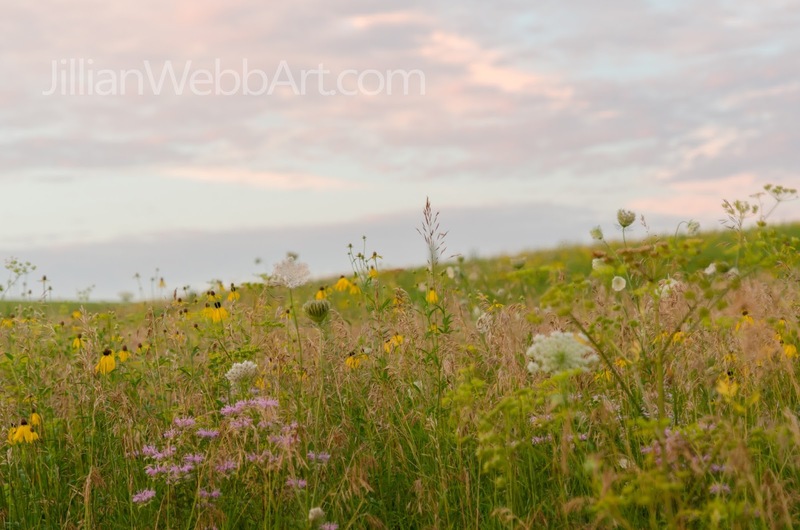 You can find Andrew Wroble's work locally at the McGregor-Marquette Center for the Arts in McGregor, IA. After folks enjoyed the festival, many meandered through our eclectic town, checked out the lovely shops, restaurants, and even popped into the 3rd annual train expo. 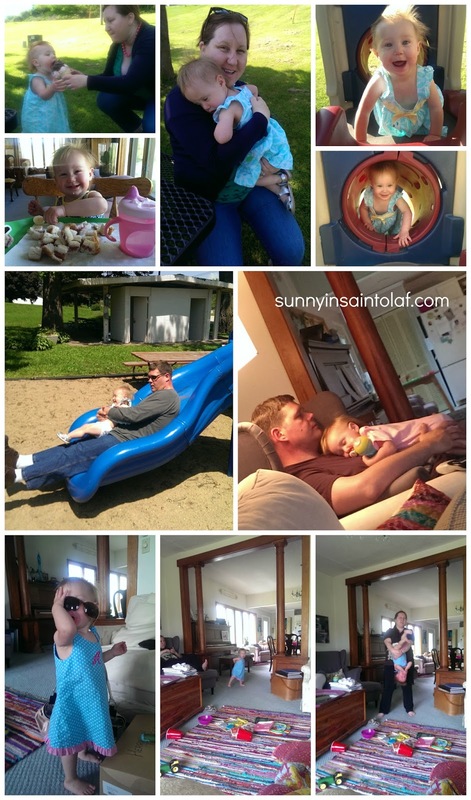 There were fun things to do for the whole family all weekend! 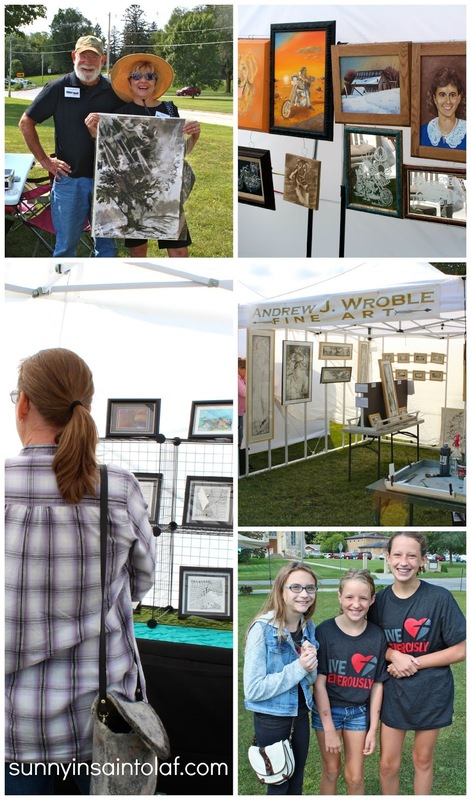 As a member of the Cultural and Entertainment District and a founding member of Elkader's Art in the Park, I couldn't have been more pleased with the overall outcome of our first ever fine art festival! We are already looking forward to next year and hope you'll mark your calendars for August 20 and 21, 2016! Enjoy these photos of our first annual event! 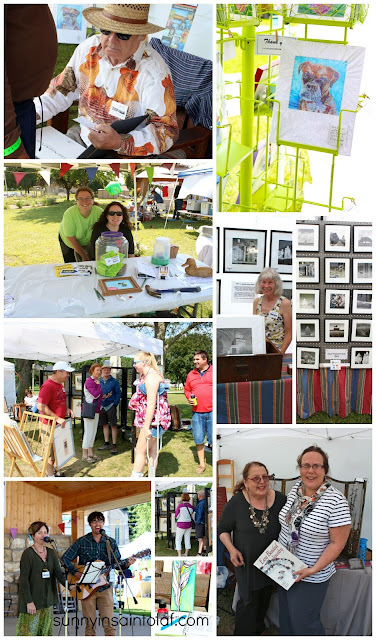 Photos by Art in the Park's official event photographer Michelle Gifford. throughout the year at various Midwest locations! If you are an artist and would like to apply for next year's Art in the Park, please go to www.ArtintheParkElkader.com and submit your contact information! Please "like" us on facebook to keep up with festival information and official notices when it is time to apply! 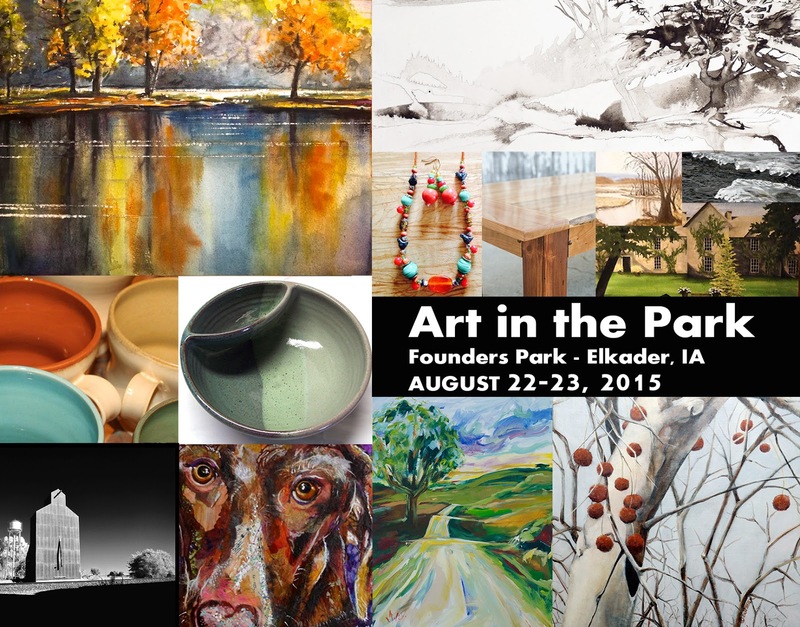 We look forward to the future of Art in the Park and cannot wait to see who is juried for 2016! Our countless energetic and welcoming volunteers! Our musicians, entertainers, food vendors, and... of course our 2015 ARTISTS! YOU, our patrons! 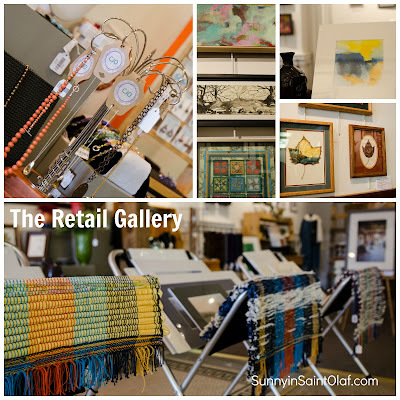 It would not be a sustainable, successful event without our shoppers who came, viewed, and purchased ART! A huge thank you to everyone involved! Our first annual fine art festival would not have been possible without the assistance and encouragement of the entire community! 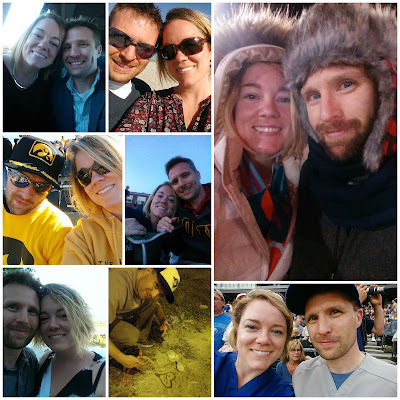 Happy 4th Anniversary to my Zachy! He's been my calm, my rock, my favorite...since our very first date. As I rush around today to prepare for this festival weekend, I couldn't be more grateful for the support system I have in my husband. I'm reminded of the anxious excitement, peace, love and joy that overflowed on this day four years ago when Zach and I said, "I do!" I love you Zach! I appreciate all of the amazing qualities (especially your patience) that make you the most wonderful husband and best friend I could have ever imagined. Being your wife is a piece of CAKE and each day your love alone reminds me that I'm so blessed. I have to say... this could be the prettiest orchid that I've ever seen! So excited that it re-bloomed and thankful I decided to keep watering it over the dormant days. Just goes to show how a tiny amount of attention can blossom into a beautiful wonderful thing. Realizing the blessing in the small things, I often think of my friends Layne (who introduced me to the happiness project) and Heather (who gave me the coolest book of awesome)! You should definitely check them out! What little things in your day make you happy? Be sure to visit Shepherd Gallery and Creativity Center to catch the current show! Celebrate the River runs through August 29th and showcases a plethora of art that pertains to, was inspired by, and relfects on the Missississippi River! Find everything from ceramic vessels, glass art, jewelry, JWebb Original Paintings (yep that's me), fiber, highly detailed graphite drawings, ink, watercolor, prints, torn paper collage, and more! 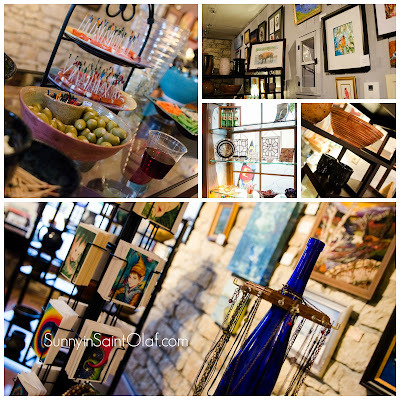 If you missed the artist reception then you'll want to mark your calendar for the next one, because it was a blast! The gals at Shepherd Gallery know how to throw a party!-And yes.... wine was involved! 214 S River Park Dr. 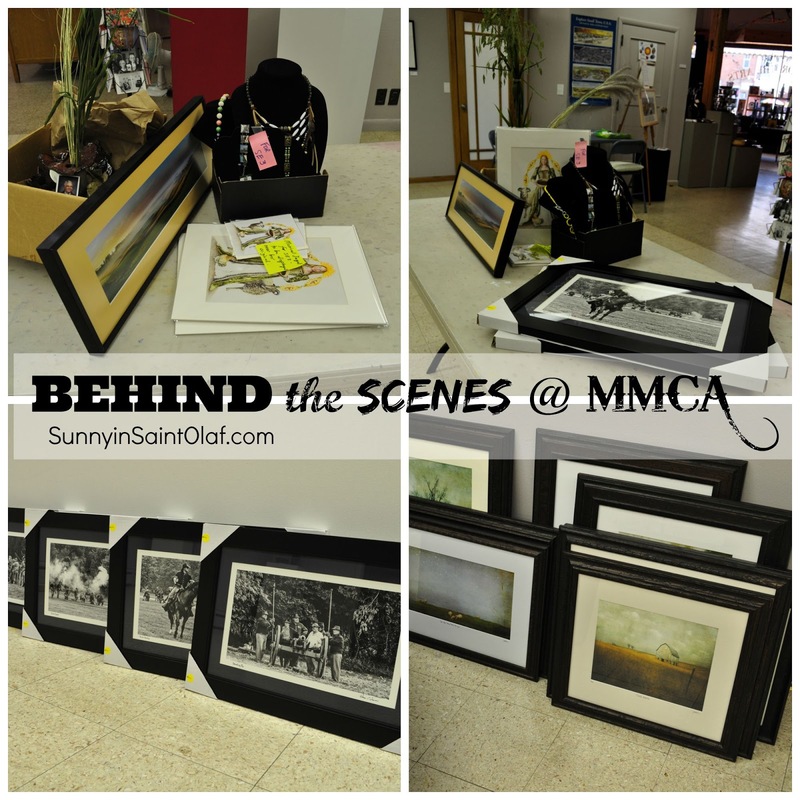 BONUS----- Meet Molly and Cindy at Art in the Park next weekend! The Guttenberg Creativity Center crew will be helping with the Kids Creation Station during Elkader's First Annual Fine Art Festival, next Sat. Aug 22 from 10-5pm and Sun. Aug 23 from 10-4pm! Join us for this ART-filled free event! With local and regional artists, culinary arts, live music and entertainment, wine & beer tasting, and Kids Creation Station.....it will be FUN for the whole family! 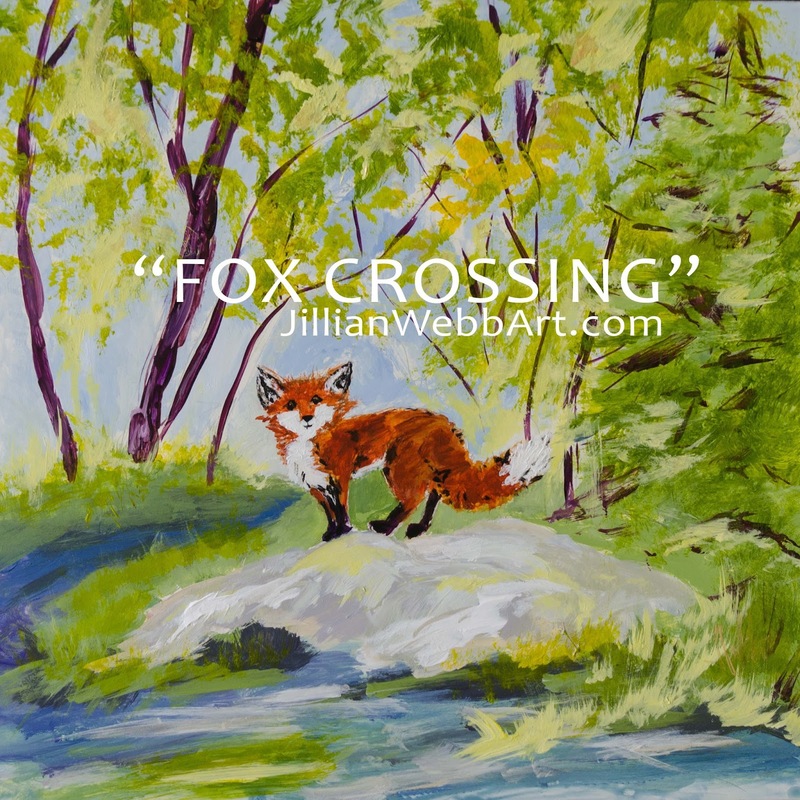 Fox Crossing│a young lady's first commission! One of the coolest things was meeting a young lady, and her awesome family. Not only did mom and dad take home a very special piece titled "Siblings," the excitement and energy they shared as their lovely bright-eyed daughter asked me if I could paint her a fox was inspiring. Seeing anyone's eyes light up when they talk about art makes me happy, but seeing these parents encourage their daughter in her first commission was off the charts! Of course, I said "yes!" -loosely representational, referenced "a day by the water," likes how that painting "blends"
Did this young lady know what she wanted? You betcha! So I headed home from the festival with the task to make a fun fox painting! "Fox Crossing" was made possible with the insight and guidance from my collaboration partner, a young art enthusiast! Congrats on your first commission, your first JWebb original! Have you ever commissioned a painting of your own? If you did, what would it be? Do you have a special piece of art you picked out yourself? 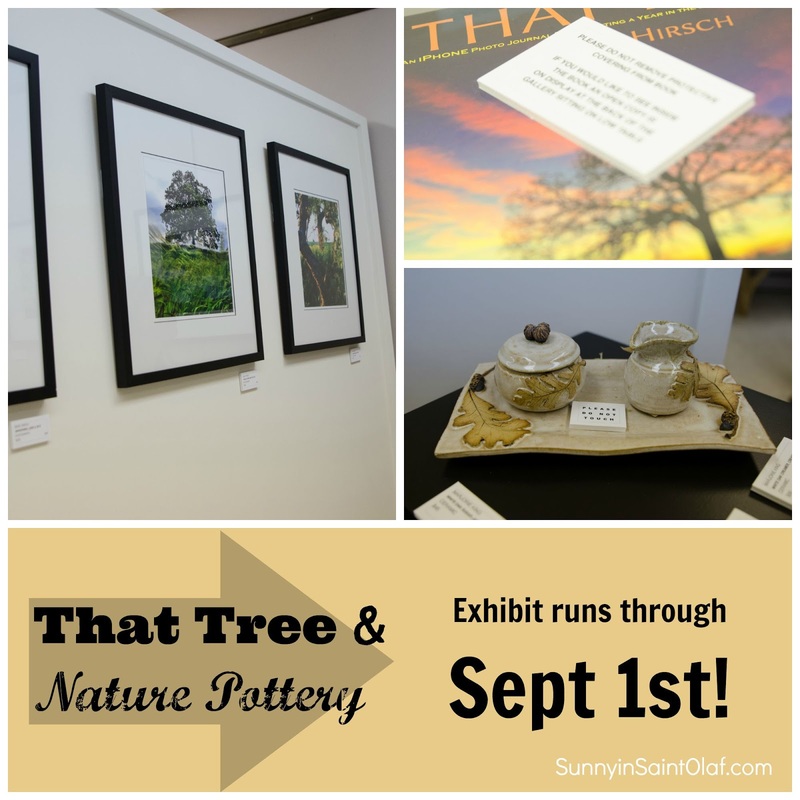 That Tree and Nature Pottery Exhibit-Check it out! Mark Hirsch, seasoned photographer and photojournalist, was skeptical when his friend first told him how great the iPhone camera was. His tune quickly changed after his very first time taking photos with his own iPhone! Like many artists, Hirsch became fixated on his subject, "That Tree": a tree he had admired for years and never once photographed. Now with his iPhone in hand, he took a photo of That Tree nearly everyday for a year. The photographs are breathtaking, ethereal, and exciting! You won't believe the variety of angles and the delicate manner in which he captured the essence of dew, snow, sun, and shadows. This show is a must-see; you'll never believe these photos were taken with an iPhone! Mark has even made That Tree available in a beautiful large hardback book. Images of That Tree were gorgeously printed and published, available now at MMCA. Pick one up at the exhibit for your home or office! 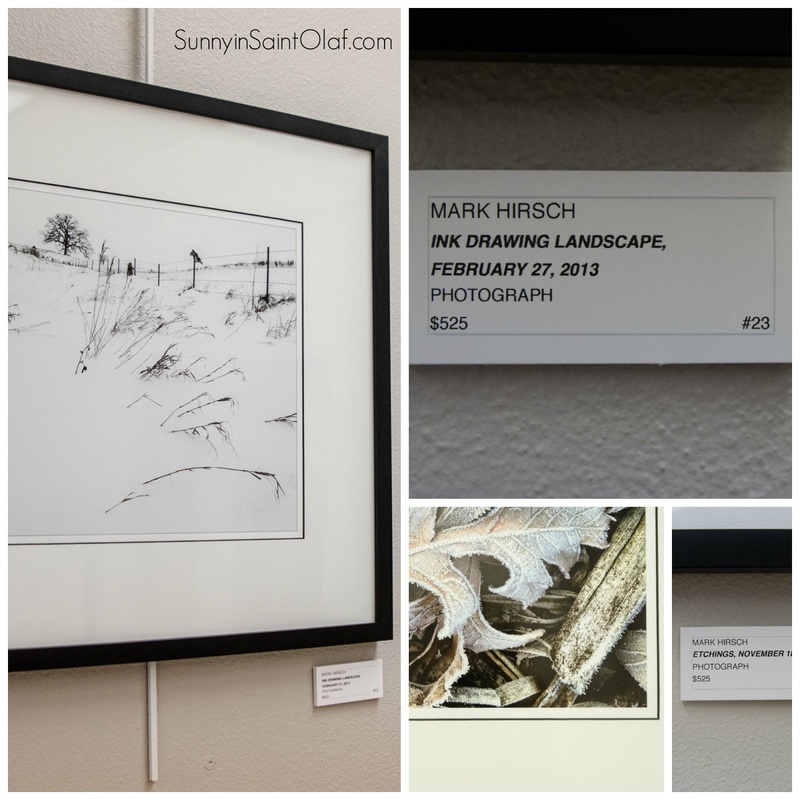 With titles like "Ink Drawing Landscape" and "Etchings, November 18th" I caught myself trying to figure out if these were actually photographs of ink drawings and etchings! I love seeing new work by other artists, so of course I was interested in checking out this exhibition, but I honestly did not think I could be impressed by iPhone photos of a single tree. WOW, was I wrong. You've really got to see these images in person. The MMCA crew has done it again with another truly mind-blowing exhibit. As if the iPhone photography of That Tree wasn't enough to excite you, you'll be equally wowed by Marjorie King's nature pottery! Displaying an outdoor theme in the current Special Exhibit gallery, MMCA is also exhibiting Nature Pottery by Marjorie King. 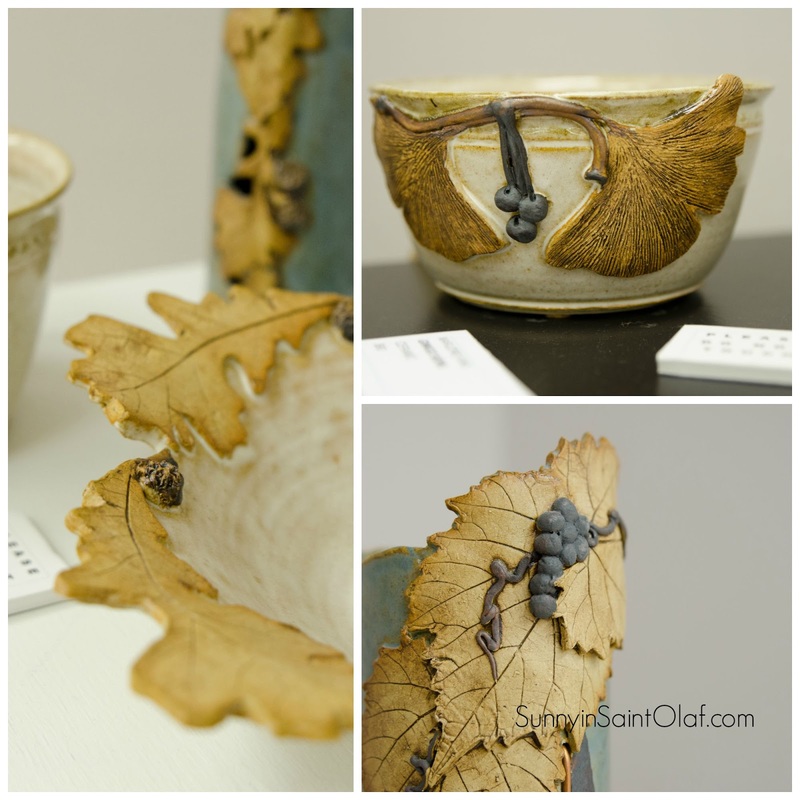 From large to small, King's ceramic works of art are adorned with tons of texture, intricate pattern, leaf and nature imagery. They are rustic yet elegant, delicate yet sturdy, captivating. The overall impression of both artists' work will make you crave a walk through the outdoors. 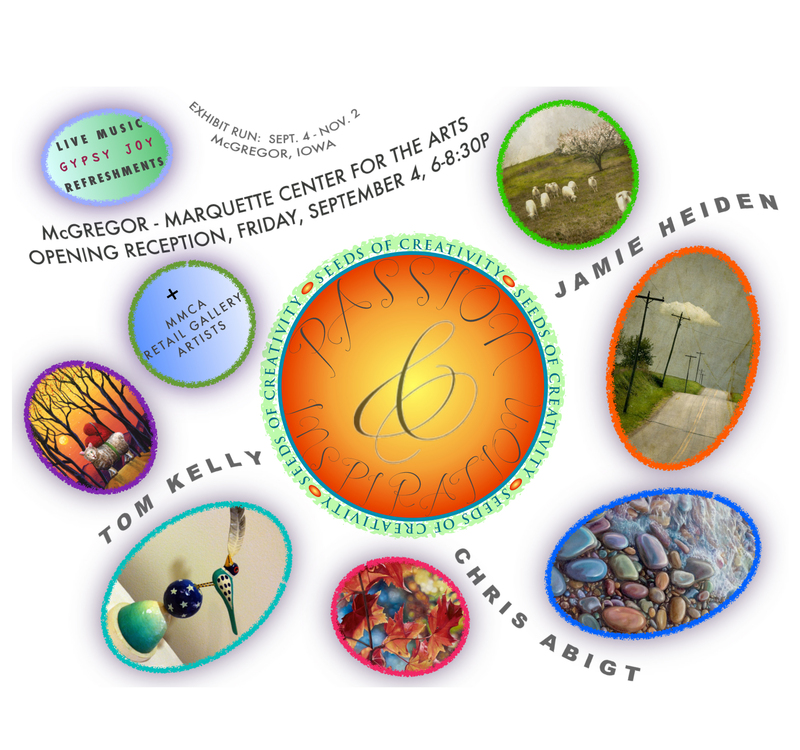 Hirsch and King's artwork show seamlessly together and I hope you'll make it out to the McGregor-Marquette Center for the Arts to catch this outstanding exhibit while you still can! The exhibit runs through August 31st; don't miss out! As always, don't forget to check out the amazing work of our region's finest artists, showcased everyday in the Retail Gallery! The photo definitely doesn't do this yummy nacho lunch justice. What can I say, I was in a HUGE hurry! (Seems to be a trend these days.) I just had to take a quick photo to show you all how I incorporated a few of our garden veggies into my "fast food" lunch today! I never have my meals planned out and half the time I'm not sure what's in the fridge. 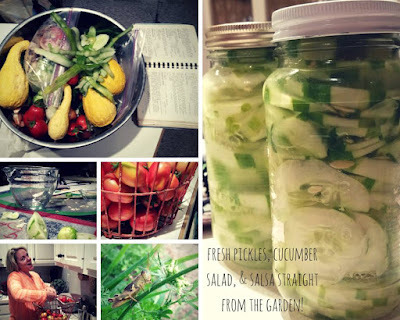 With the garden producing lots of cucumbers, squash, and green beans at the moment, I've been trying to think of different ways to use all of my fresh produce! So, I decided to whip up a quick nacho lunch today. Luckily, Zach and I almost always have homemade salsa in the fridge, tortilla chips in the cupboard, and shredded cheddar cheese on hand. Since I didn't have sour cream, I decided to use my greek yogurt and it was awesome! What fun veggies will you throw in from your garden or grocery? Have you ever used Greek yogurt in place of sour cream? This is probably my favorite light summertime lunch, what's yours?! 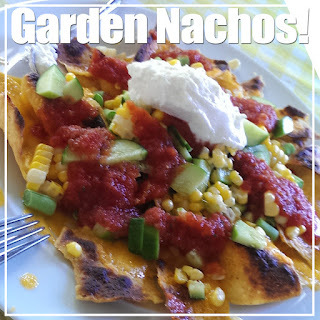 Labels: Garden, how-to-DELICIOUS!, personal, Summer 2015! I spent this past weekend showing my work and sharing stories in La Crosse, Wisconsin. 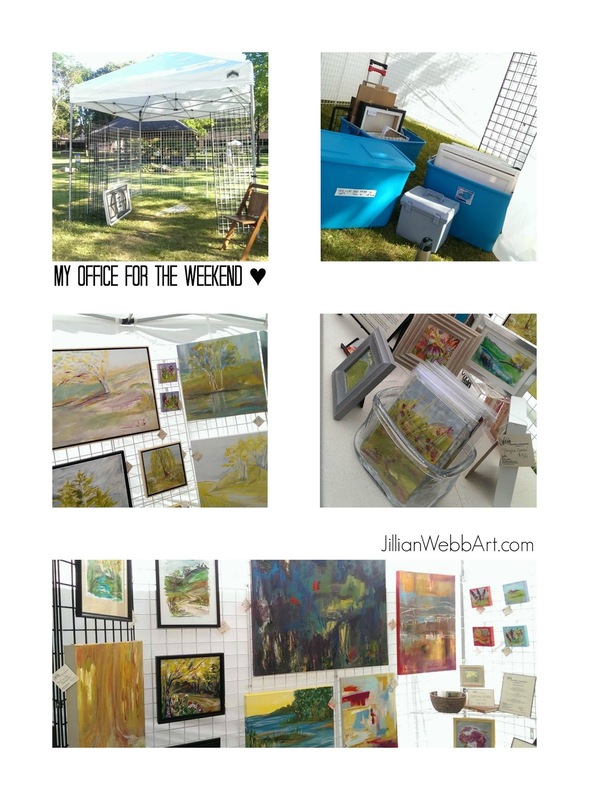 It was my first Midwest fine art festival, Art Fair on the Green, and it was a blast. Thank you so much to all of you who visited my booth, offered a kind word, and a special thanks to those of you who purchased your first JWebb original painting! It was a truly wonderful weekend filled with art, new connections, and sunshine! Being on a Midwest adventure with the darling Kate, my great and talented ceramic artist and friend! Selling several people their first "original" piece of art! Reminiscing about my move to the Midwest! Two years this weekend, still can't believe it! Talking ART, inspiration, joy and life! Thanks again to the wonderful volunteers and people of La Crosse for welcoming us to your beautiful city and 57th annual Art Fair on the Green! We'll see ya next year! There is so much that goes into any business and I am ever grateful to those who've helped and encouraged me along the way. From a simple kind word, the purchase of a greeting card, to the sale of a large work or commission, each transaction and encounter enables me to do what I love and love what I do. Thank YOU! I would also like to say a special thank you to my friends and family who continually support and believe in me. Thank you to my awesome friend Adam who helped me with my new festival display, to my hubby for fending for himself all weekend and being my biggest supporter, and of course a huge thanks to my artist buddy Kate for recommending Art Fair on the Green and making the trip with me! I ♥ each of you! 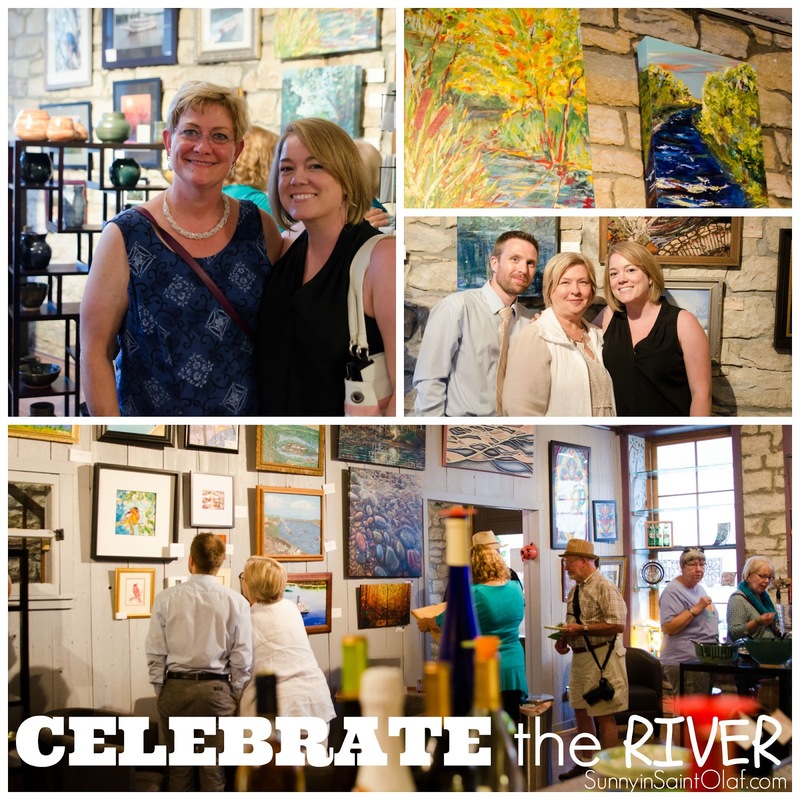 ART Review: A look at the Celebrate the River exhibit @ The Shepherd Gallery, Guttenberg, Iowa. 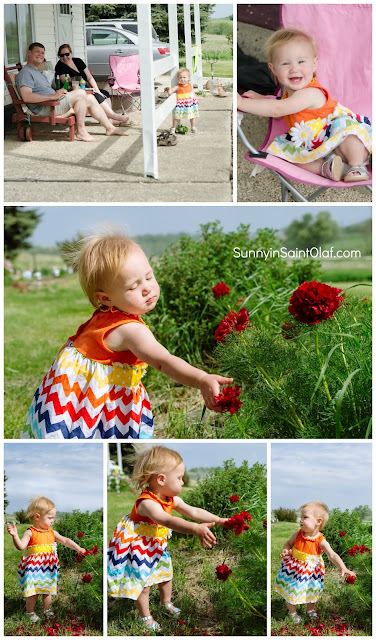 DIY: Refresh & Refurbish Old Picture Frames! How-to-Delicious: Homemade Pizza made EASY! Not only are orchids gorgeous, but I love how long their blooms last! I definitely don't pride myself on keeping plants alive, but some of these exotic-looking whimsical flowers will last for months, and you barely have to tend to them! You can find them at almost any home-store, plant shop, or sometimes even your local grocery. 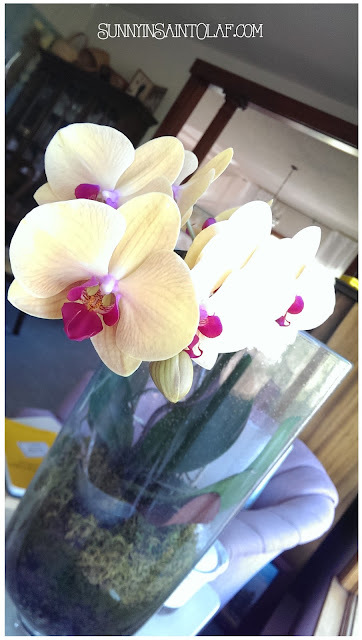 For these reasons, I've always been quick to purchase an orchid to spruce up my living areas, especially before company or cocktail parties☺. 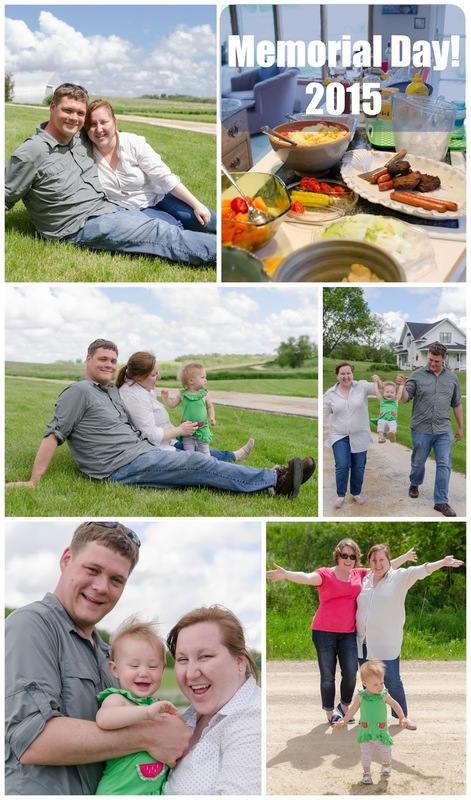 Last summer my mom, Aunt Kym, and cousin Leslie came for a visit out at the farm. Wouldn't you know one of my last minute preparations was picking up groceries, but I forgot to get an orchid! Thankfully, my sweet hubby grabbed one off of the clearance rack for $5! 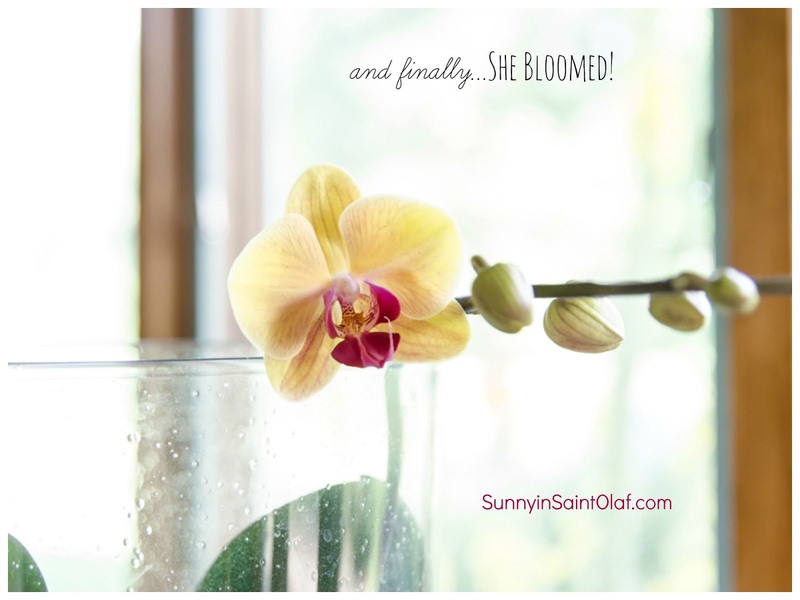 It was beautiful, and like usual, the blooms lasted at least a month. In the past when the blooms have faded, I've given up on the plant and eventually thrown it out. Last year I decided to keep up with the occasional watering because the glass container looked so pretty filled with the large green leaves. They say adding 3 ice cubes a week is proper but I just poured in about a 1/4 cup of water whenever I remembered... which probably equaled every other week or so. 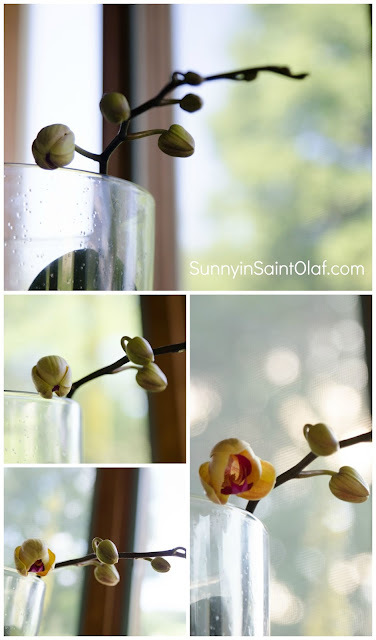 Over time the roots began to grow, and I began to realize that the orchid could potentially re-bloom! I've never kept one long enough or tried to get it to re-bloom before. I kept up the occasional watering and one day a month or so ago, there it was.... a brand new shoot! After nearly a year of waiting (suspenseful waiting the past two months), my occasional watering paid off with the most beautiful orchid bloom I've ever seen! With the occasional watering (such a small act), some resilience and forgiveness for those weeks I forgot about it, this little orchid taught me patience, inspired hope, and created joy. What a beautiful blessing. Life is full of precious moments. Witnessing this little orchid re-bloom was another reminder for me to slow down, take notice, and enjoy the small things. Ava Does Iowa & Our Memorial Day Tradition! 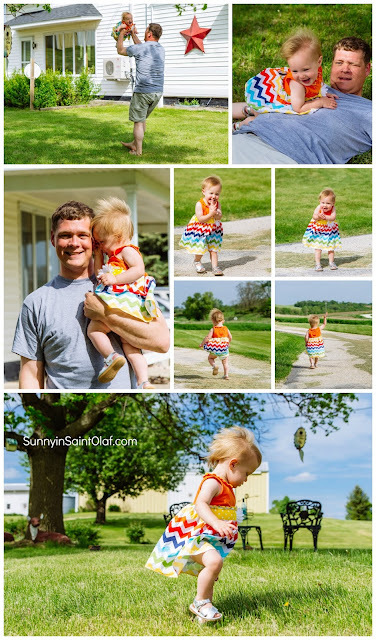 I'm finally posting the amazing week spent sharing northeast Iowa with my sweet friends and their beautiful baby girl! Since Heather and I met nine years ago, we've kept in touch with facebook, facetime, emails, texts, and phone dates. We've watched each other find our soulmates, taken vacations together, helped with each others' weddings, traveled to see each other all over the world, and most recently, we've celebrated as she became a MOM! One of our favorite traditions has always been getting together over the long Memorial Day weekend. Most years we've spent Memorial Day weekend in North Carolina, while some years we've had to adjust our "traditional weekend" by a few weeks. Only once or twice we were unable to get together. This year we celebrated on the farm as they got to spend an entire week with us! We had so much fun and managed to take a "few" pictures of Ava's epic trip to visit her Aunt Jilly and Uncle Zachy! She's Gone Country! 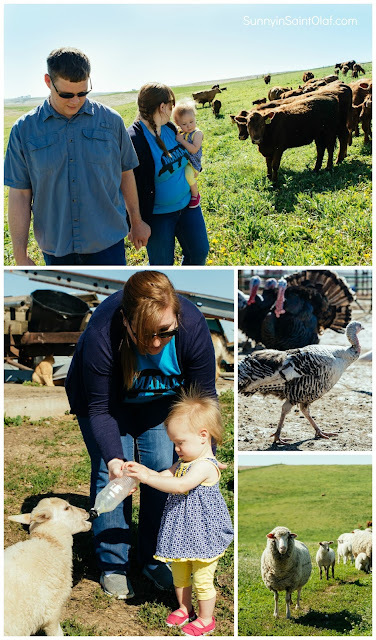 We visited the neighbors' organic livestock farm! 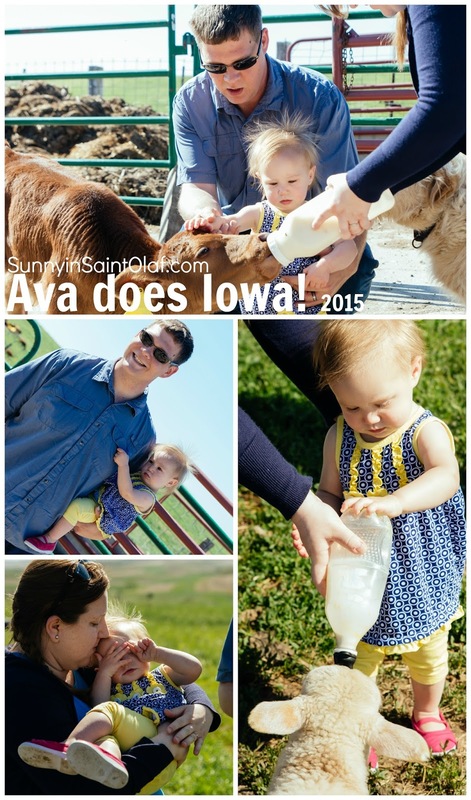 Ava got to meet Miss Jilly (the calf named after her Aunt Jilly) and even bottle fed a calf and lamb! It was fun watching Ava interact with the animals, but I think her mommy and daddy enjoyed it just as much and maybe more! We played at several fun parks in Elkader, Marion, and even while enjoying ICE CREAM at The Burger Barn! SILLY! Us grown-ups even enjoyed a ride down a slide or two! There were lots of snuggles, sleepy afternoons, and baby hugs. Girls Day! Heather and I made it to a morning YOGA class, had lunch at an Algerian restaurant overlooking the river, and spent the day shopping while the guys babysat! Guys Day! The guys had a movie day and made a trip over to Wisconsin, while us chicks hung out on the farm during a lazy rainy day. Ava played dress-up with Aunt Jilly's sunglasses and giant purse! The Farmhouse turned into a FUN-house! Ava loved Aunt Jilly's PB&J sandwiches! We had an amazing dinner at Fennelly's Irish Pub! These Irish pub connoisseurs gave it a THUMBS UP! 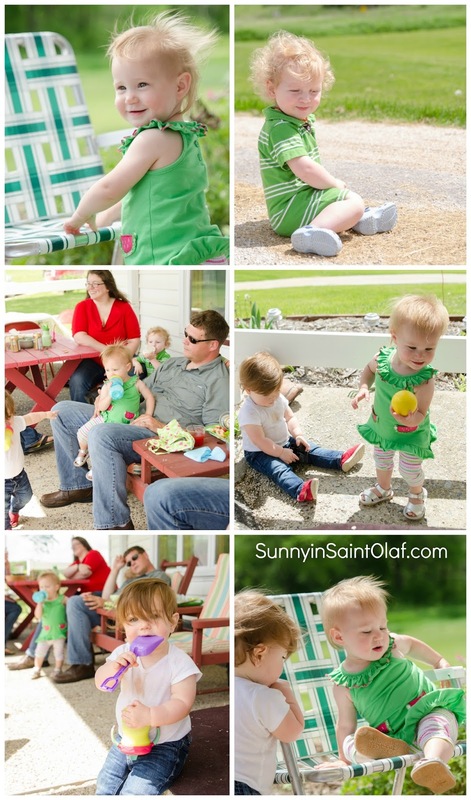 We cooked and grilled out on the farm, enjoyed cocktails and lots of front porch time! 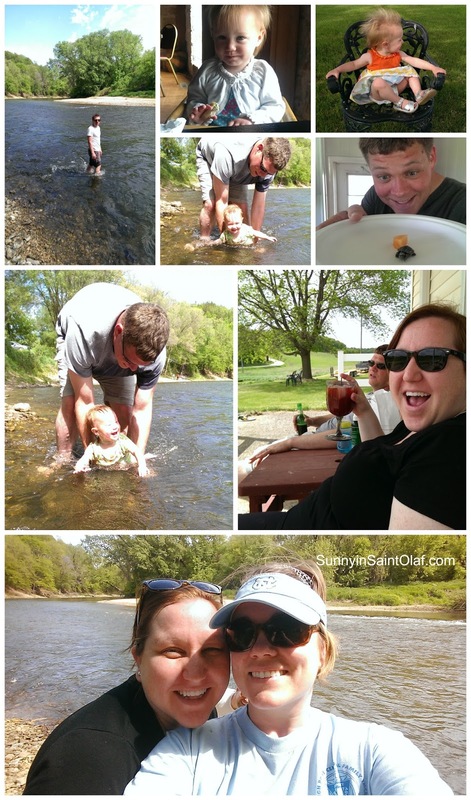 Ava LOVED splashing in the Turkey River with her daddy and Uncle Zachy! 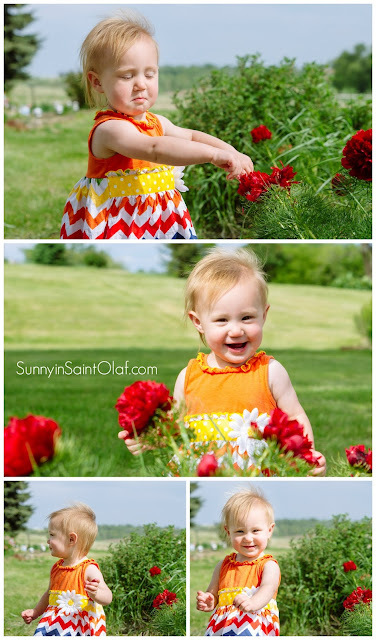 She also loves Aunt Jilly's cellphone and flowers! Who could say no to that sweet face? And of course... MEMORIAL DAY! I'll cherish these memories for always! Heather and Nate, THANK YOU SOOOO Very MUCH for taking time off of work, packing all of those baby gadgets and gizmos, navigating the airports, flying with Ava for the first time, and spending a whole week with us on the farm!! We love you guys!! Labels: Adventures!, family♥, friends, outdoors, personal, Summer 2015!